If you’re a fan of using gestures for navigation, you’ll be pleased to know that you can navigate browser history in Safari for iOS (versions 7+) by simply swiping back and forth. This basically functions as an alternative to the traditional Back and Forward buttons in Safari, allowing for quick swipes to go forward or backwards a page as needed while you’re browsing. It’s easy to use once you get a hang of it, but can be a little odd to figure out how it works at first. The trick to getting these back and forth swipe gestures to work properly is to swipe from the very edge of the screen in the intended direction to head in Safari’s history. This makes it a bit more challenging if you use a large or bulky case on the iPhone / iPad because it can block the edge of the display, causing the gesture to go unrecognized. While learning, you may want to temporarily pull the case off the iOS device, or even try starting with your finger off the screen and swiping across from there, rather than starting on the display itself. 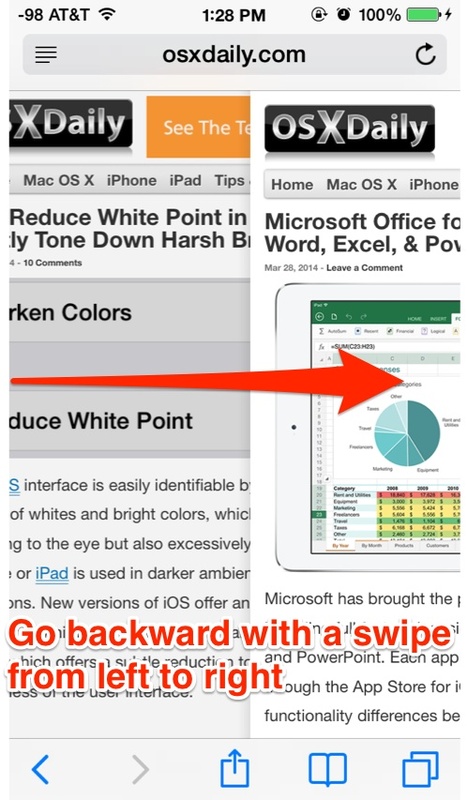 If you’re having any difficulty getting this to work, remember to focus the swipe from the very edge of the screen. While you can swipe back to the very edge of your history, it’s best used for quickly going back a page or two, and more in-depth history browsing is best done by holding onto the Back and Forward buttons to summon the history browser as usual. Additionally, if you’re a regular user of iOS Safari’s Private Browsing feature, you may find the history to be significantly limited or even nonexistent, which can reduce the function of the swipes. Private Browsing is easily identifiable as being a dark/black themed browser, whereas normal Safari is white/light themed. 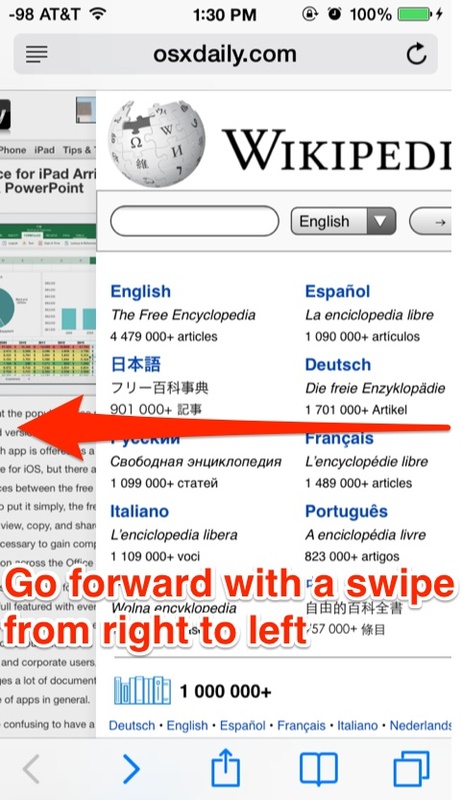 The Swipe to go Back gesture is almost universal in iOS and works the same in the Settings apps, App Store, iTunes, and other apps, whereas the Swipe to go Forward gesture seems to be limited to Safari, at the moment anyway. Those with Macs who have multitouch trackpads or a Magic Mouse will find the Mac has similar back/forth swiping amongst a variety of of other gestures in OS X.